This Director-based story CD is the fruit of an excellent collaboration between writer Damien Filer and artist/composer Max Springer. The CD includes 11 of Filer's early short stories, most of which were previously unpublished. As a diehard Web geek, I can't run something like this without first focusing on the presentation of the stories rather than the stories themselves. And I'm very pleased to report that the design, music and programming of this CD are all great. The Director/Lingo work of programmers Rick O'Neil and Benjamin Boe is smooth and sound -- no nasty system hangs or freeze-ups on my test machine (a 100 MHz Power Mac with 48 MB of RAM). And since the README file indicates the CD programming is a port from Windows, it's bound to run even better if your machine happens to be a slave to Microsoft. The user interface is attractive and intuitive, and the text is supremely readable. Springer's Photoshopped graphics range from being pleasant eye candy to quite good graphic design. And so we come to the stories, which are of course the whole point of the CD. I've been a fan of Filer's work for several years now, and the stories do not disappoint. Most of the work here falls roughly in the category of dark contemporary fantasy, and several stories are squarely in the mainstream without a hint of fantasy. Filer's fiction is more literary than genre-bound and is by turns sensual, touching, and disturbing. Standout stories include the opening tale, "Addict" (which originally ran in Buried Treasures: An Anthology of Unpublished Pulphouse Stories), "Marmalade", "1-900-THE-KING", and my personal favorite, "And the Band Played On." The latter story is the tale of what happened to the Titanic's crew and passengers after the unsinkable ship sank. It is presented as a series of entries from the posthumous log of Captain Edward J. Smith and chronicles both the ship's ghostly journey through time and the captain's coming to grips with the mistakes he made in the name of upholding law and order. 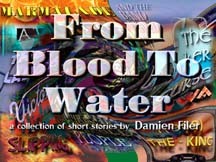 From Blood To Water is available from Amazon.com.